I’ve gone back and forth over the years on smoked salmon. We enjoyed it weekly for a while, but then I learned about all of the additives and nitrate issues. Ugh. That knowledge ruins so many awesome-tasting foods, doesn’t it? We were still enjoying some once in a while, but when I discovered the “salmon trimmings” at our local grocer, it was back on! Not only do they only use hickory smoke and salt to cure their salmon, no other ingredients, but they also sell the “trimmings” for just $8 a lb (basically the leftovers when they cut pretty squares of the salmon). And let me tell you, a half a pound of salty smoked salmon goes a long ways. In fact, we find their salmon to be a bit too strong, so I’ve had to tone down the amount I use per serving. 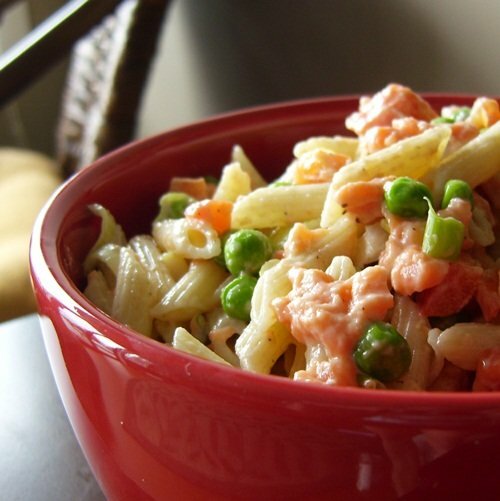 My husband really liked the following pasta salad recipe, stating that the salmon added a nice flavor, but didn’t overpower the dish at all. One thing I did discover though, vegan mayo doesn’t work quite as well in pasta salads from an overnight standpoint. It was beautiful on the first day, but unlike “regular” mayo-based pasta salads, it didn’t improve with age. The dressing got a bit thick. This was easy to remedy with a touch of added oil, and the dish did heighten in flavor by the next day. If you want to keep the dish vegetarian / vegan, try using chickpeas in the mix instead of salmon. While it won’t have that fishy flavor, the mixture of vegetables, pasta, mayo, and old bay is quite nice on its own! Cook the pasta according to the package directions, and rinse it with cool water. Whisk together the mayo, lemon, old bay, and pepper in a small dish. Add the mayo mixture and all of the remaining ingredients to the pasta in a large bowl. Serve, or cover and refrigerate until ready to eat. For a vegan version, add some ground kelp (1 tsp or so) to give it more of a fish flavor. I do that with a chick peas salad and it really makes it like a tuna salad. Should work here! Sounds delish Marta! I’ve done the chickpea thing for mock tuna, but only had nori on hand, which just got soggy. I’ll have to pick up some kelp. Thanks for this suggestion! Hannah, smoked trout isn’t something I came across much in years prior, but lately it seems to be popping up more in the U.S. – and it is good! Brilliant idea to stir the fish in at the end. It loses so much flavor when cooked in. Ironic timing with this post. Not only did I just read a recipe about smoked pork (the only way I’ll eat pork), but I had smoked salmon for only the second time in my life a couple weeks ago, and I have been craving it since. I didn’t think I liked it before that. I am actually shopping online for a stovetop smoker. I found one for only $30 and I’m really tempted to buy it. Seriously, Mike doesn’t know what he’s missing! I can’t believe Ella is already a year old – time flies! So glad you had a great Mother’s day – flowers and salmon! PS–I can’t remember if I told you this or not (mommy brain so sorry if I am repeating myself)…but I met someone in my library a few months ago who’s family all have terrible food allergies. I was telling her about both of your sites and she heard of Alisa Cooks and said she used your recipes. 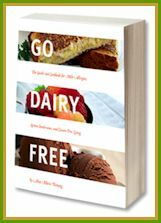 I told her to check out Go Dairy Free also…thought you would enjoy knowing that! Aw that’s so wonderful – thanks Laury! Guess I better get back to putting recipes up here! I’d only been posting them on GDF for the past several months, but I’ve heard that some people just look here for recipes. Whoops! 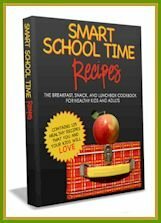 Hi, I just finished reading your book, Smart School Time Recipes and I loved it! So many recipes I am going to try. I am wondering why you do not include nutritional information for your recipes? This information is very important to me and since your recipes are so healthy it seem it would make sense. Other than that, I think all your recipes are great. While I would love to include nutrition facts, it takes a lot of extra time, and since I don’t track calories and fats myself, it would definitely add to the pile. I may add nutrition facts in future books, but for free and online recipes, I may not be able to accomodate. I’m sorry! But you can look up nutrition facts online via sites such as nutrition data to check them out for your needs. This works brilliant with rissoni too for that gourmet look! Thank you so much for putting salmon in pasta salad form. I love my salmon and find it a staple during the summer time. Thank you, this looks delicious! Great recipe! Love the “mayo” alternative for a -dairy- creamy sauce. Worked great! Sounds like a delicious dish, how do you prevent the salmon from becoming overcooked?